Waringstown captain Greg Thompson praised the efforts of his team in the 2018 campaign after they won the Clear Currency Irish Senior Cup with a 85-run victory against Merrion at Stormont on Saturday. The win marks their sixth Irish Cup title, making them the most successful team in the competition, moving past North County’s tally of five. They also won the Challenge Cup, Twenty20 Cup and All Ireland Twenty20 Cup to register another fantastic season for the team, and Thompson already has his sights set on backing it up next year. “It’s our sixth overall and that puts us in front of a great team in North County,” he said. “We can enjoy this success and we have had a good year. Congratulations to CIYMS on winning the league. “They have proven they are probably the best red ball team, but I think we can enjoy our end of season dinner as well. “We look forward to going again next year and we are hoping to back it up for a third time. People say it’s tough to back it up one year. Shaheen Khan was named Player of the Match after his 71* and 2-23 from six overs in what could be his last game for the club, and now has 786 runs and 25 wickets in 2018. James Hall and James McCollum also went past fifty to help Waringstown set 264-7 from their 50 overs which they were able to comfortably defend. Khan has had a fantastic campaign, and Thompson believes the strength in-depth of his squad has been the reason they get over the line in big games. “He has had another brilliant season. “There is enough quality in the team that we dovetail well, so if it isn’t Shaheen’s day, someone else will also step up. Spinner Gary Kidd has played from the middle of July with a broken finger on his right hand, and although it doesn’t hamper his bowling, can’t be easy to field with. 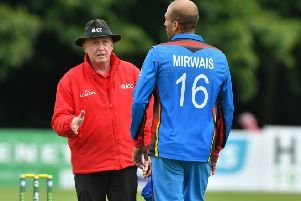 A lot of credit has to go to Kidd for the way he has got on with it, and he took the big wicket of John Anderson with just his third ball before dismissing Michael Lewis for 46 to really put Waringstown in the driving seat. A core group of 12 players have played in the majority of games this season, and Thompson says the whole squad will rest up over the winter before it starts all over again in 2019. “Ando is definitely the key wicket. “His record in Irish Senior Cup finals, and his record in the competition in general is phenomenal. “For Gaz to come on in his first over and get him was a massive lift for us. He has soldiered on for us with a broken finger. “Injuries happen during the season, and we have dealt with them well. We rested guys when we could and rotated the squad. “There were 11 guys on the field today but 16/17 that have been used throughout the year. Waringstown were holders of six trophies before CIYMS took the Premier League from them, and Thompson has dreams of achieving the perfect season. “I would love a perfect season. We had six trophies in the cabinet, but that was slightly false because two were up for grabs at that time. “We lost one and won the other back, but a perfect season would be something special. There are plenty of good teams out there. “I’m ambitious and this team is ambitious, so why not aim for the lot,” he added.